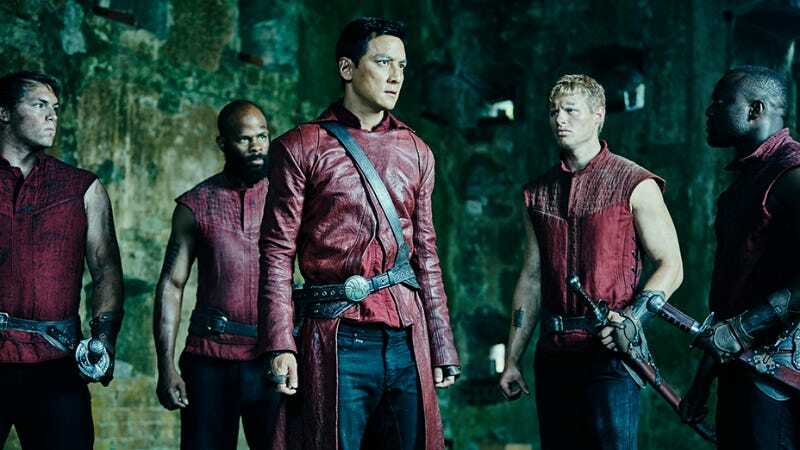 Just like that, all six episodes of AMC’s Into the Badlands have (already?!) wrapped up—and with it go some of the most mesmerizing, elegant on-screen battles ever produced on an American TV program. I’m going to fill the hiatus WITH prayers to the cable TV deities urging AMC to officially greenlight a second season. Spoilers for last night’s season finale below! Quinn. Freakin’ Quinn! I know I complained a lot about the one-dimensionally evil schtick of his character, but I was totally shocked when he bit the dust, and am kind of bummed that he was offed so early. (He looked pretty dead... right? Like officially nixed?) I would’ve liked to see more character exposition to build up tension between him and Sunny, though, which would’ve made Sunny’s treachery all the more satisfying, but looks like the show’s bearded antagonist was written off pretty quickly. Also, Sunny’s fight against the Abbots?! Damn. It was cool, and I loved Sunny’s double-sided sword, but this fight really straddled the line between fighting and dancing for a second—maybe a little too much for me, at times. The synchronized punches reminded me of a cheesy Power Rangers pose or something, but hey, that trio sure beat the crap out of Sunny. And looks Sunny is from Azra after all! The Widow, too? How did she lose her M.K.-like death powers? Did Sunny also have them at some point? I also loved the Tilda/Veil/Widow subplot with the medicine and poison vials, and learning more about the Widow’s past, and how she’s got more layers and underlying contradictions to her personality and story than Quinn ever did. I talked to Daniel Wu, as well as showrunners Al Gough and Miles Millar last week, and all three of them sounded extremely confident that AMC would bring the show back for a second season. Anyone else out there besides me who wants to sign up for a kung fu class in the meantime, or watch the entire Bruce Lee oeuvre? What did you guys think of the season finale?